Happy Friday! Hope you all had a great week sort of like those of us who are fortunate enough to experience the Balloon Fiesta in Albuquerque. It's a magical experience even just driving to work in the mornings with hot air balloons lazily floating overhead. Be sure to check your local TV listings because you might catch a glimpse of a time lapse video... just as cool and you don't have to brave the crowds! Note: If you hurry and scroll back through Bing.com's photos to 10/8/18 (I believe they only keep them for 7 days), you can also find a very cool scene of the fiesta. 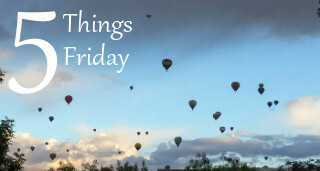 But, even if you're not journeying to The Duke City this year, I think you'll at least appreciate this week's "5 Things." Enjoy! 1) Guy Raz from NPR made a surprising appearance on The Tonight Show with a great interview. His radio show How I Built This is worth checking out if you haven't already! 2) This athlete had no idea that Nike wanted to offer him a pro contract. He's the first athlete with Cerebral Palsy to receive such an honor. Tissue box alert! 3) Did you know that you can probably recognize around 5,000 faces? The human brain is an incredible thing! This would also explain a lot of those weird dreams where you see people but don't quite know their names. 4) Sometimes, you just need more cowbell. 5) The support animal factor just stepped up a notch with a support squirrel. I guess that would be okay unless you want to take it onto an airplane. No rodents, apparently! Couldn't you just see what would happen if the squirrel got loose and decided to "explore" the cabin? A lot of screaming, I bet!